Just like every other agribusiness venture that fails when the right things are not done, poultry farming business will also fail if some steps are not taken or if some mistakes are made. almost all your birds. These could lead to a significant loss to the farmer. If you ask any poultry farmer, they will probably give you a list of things they would have done differently in their poultry farming business. Every poultry farmer has made mistakes at one point or another, some of them affect your poultry birds a little, but others can lead to your birds getting seriously injured, or even killed. 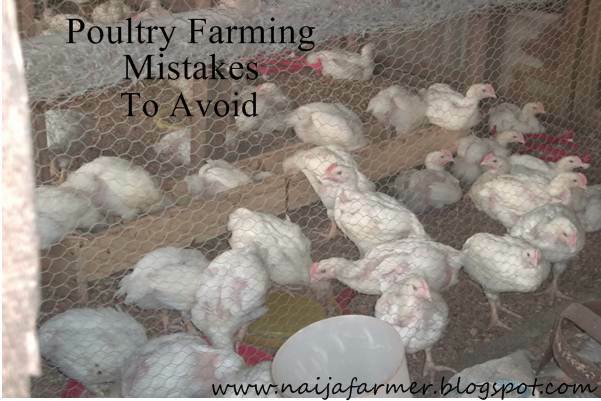 However, every poultry farming mistake or mismanagement should be avoided completely to ensure maximum profit from your birds. 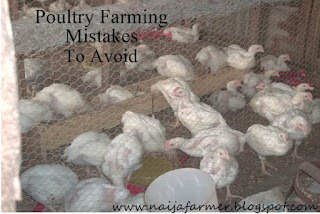 I have highlighted some common poultry farming mistakes farmers are guilty of and how to prevent and solve them in order to achieve maximum profit from your poultry birds. Hopefully, you can learn from some of these common mistakes, and prevent them from happening to you. Buying birds from unknown sources are very risky for many reasons. For one thing, you don't know what you are getting. The birds may have health issues or carry diseases that may not be apparent at first. Another reason not to buy birds from unknown sources is to avoid dishonest breeders. For instance, you might order for broiler chicks and the chick seller or breeder might supply this white cockerel to you. If you're a new farmer you might not know what was sold to you, and the birds won't grow fast. While there are a lot of very good breeders with very high-quality birds, there are some that either are not knowledgeable about the birds they raise, or just plain scammers. Before you stock your farms with poultry birds make proper research on where to get quality birds. Remember good, healthy and quality birds are is will help you make more profit from your poultry farming business. Note: When adding birds to your flock, it is a good idea to quarantine(separate them from the main flock for some time) them for a little while before adding them to the rest of your flock. When your poultry birds are fed properly with quality(balanced), unadulterated feeds the outcome is a boost in production. This is seen in the fast growth of birds, increase in egg production and general well-being of the bird. That is if the bird is the right breed and is healthy. Making the mistake of not feeding your birds properly(that is not feeding in time with quality feeds) could lead to a reduction in the growth of birds, egg production which will finally affect profits and income from your birds. Due to a high cost of producing poultry feeds, some producers have begun adulterating feeds in order to make more profits. When you feed your birds with adulterated feeds, your poultry birds will be affected badly. If you purchase feeds take the time to source from a trustworthy feed producer or company. Most times the best thing to do is to formulate your own feeds with the ingredients, in order to be sure of what you're feeding your birds. This is a common mistake. Keeping birds housed in dirty, poorly ventilated, and dark coops can lead to many health issues such as respiratory problems, mite/lice infestations, decreased egg production, and a host of other health issues and diseases. Make sure to keep poultry house beddings clean, and change it often. Make sure your coop is well ventilated with plenty of air flow. Light is also important. Don't keep your birds cooped up in a dark coop without natural light. To do this use dwarf wall system for your poultry house and build the poultry house facing the East-West direction. Believe me not selecting the right breed can affect your poultry farming business seriously. buying your flock, decide why you want to rear chickens. Do you want them fo the production of meat or eggs? Decide carefully on what breed(s) you want. For example, if you want to produce eggs, don't buy a breed that doesn't lay enough eggs. You've to specifically tell the breeder or chick distributor the breed of birds you want. Keep climate in mind too, and pick a breed that does well where you live. It is very important to observe your birds everyday so that in case you have a sick or injured bird you will notice it in time to remove it for treatment. Becoming accustomed to your bird's normal behavior, and observing them daily is a good idea. Your birds all should be active and have nice bright eyes, healthy red or pink combs, and their feathers should be clean, glossy and well preened. (Keep in mind that there are exceptions to these last two while your birds are going through their annual molt). of injury. Also, check for mites and lice, and expect the bird's legs for scaly leg mites. Treat the bird, watch for some time before sending it back to the flock. Overcrowding can lead to stress, cannibalism, feather pecking, and other issues. The floor space requirement of broilers varies depending on their body weight at the time of marketing, housing systems, marketing age and ambient(room) temperature. A broiler chicken of 18 days old needs a space of 450 sq.cm while from 19-42 days old will requireb1000sq.cm. Multiply it by the number of birds you intend to stock. Remember this is an approximation, it is best to know what is best for your birds. Remember, there is no such thing as a 'poultry house is too big'. You may plan on getting 50 chickens at first, but you may want to expand your business in the future, so instead of rebuilding a new poultry house when your flock expands, it's a good idea to build a bigger one from the start. Most new farmers always make a mistake of starting poultry farming without having a cost analysis report and doing feasibility studies. You have to keep the resources on ground to fund your farming venture from start to finish. This will help you from having an abandoned project. To be successful in poultry farming business you have enough money in order to purchase feeds, drugs and so many other things that may arise in the course of the poultry rearing. Most chemicals, pesticides, herbicides, and rat poisons, are deadly to your birds. It is best to avoid using such items around your poultry house, or anywhere that your birds range. than it, and ingest the chemicals, which can cause illness or death to your birds. It is best to use such chemicals sparingly and with caution around your flock. Anyways this applies to birds that are on free range in the farm.